Unstoppable Toughness For Any Job. With a signature ROUSH blend of superior engineering and bold styling, the 2019 ROUSH Super Duty is built to handle the toughest jobs and turn heads on or off the road. "ROUSH Performance. On and Off the Road" Jack Roush Jr. The 2019 ROUSH Super Duty has been designed to bring legendary ROUSH performance-inspired styling to even the toughest jobs. 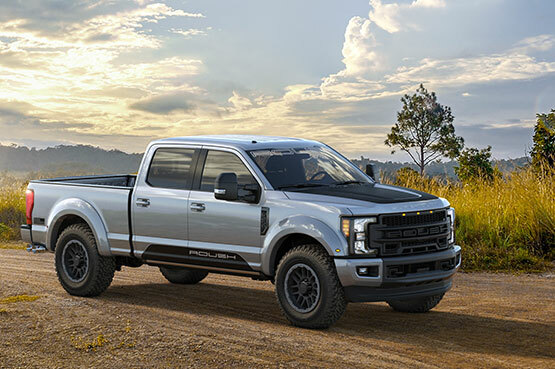 The 2019 ROUSH Super Duty is available with either the 6.2L gasoline V8 or the 6.7L PowerStroke® Turbo Diesel V8 engine from Ford’s lineup. Our signature ROUSH grille, custom wheels, and sporty graphics package make the ROUSH Super Duty instantly recognizable on any road. The included ROUSH/Fox 2.0 Performance Series Suspension System provides firm stability on and off the road, even while towing or hauling heavy loads. This system includes upgraded front and rear shocks to improve handling and accommodate larger tires without any loss of factory tow capacity. The included Leveling Kit gives the ROUSH Super Duty an aggressive and capable stance. On all diesel-equipped models, the included ROUSH DPF-Back Exhaust System increases air flow and delivers a powerful exhaust note through dual custom 5” tips. 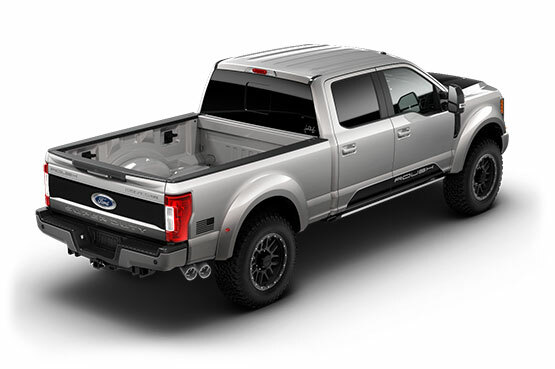 The 2019 ROUSH Super Duty features aggressive styling cues including a front grille with a prominent horizontal bar design proudly displaying the ROUSH logo, body color-matched fender flares with integrated accent lights and a ROUSH bumper cover designed to work with factory adaptive cruise control systems. The truck also features body color-matching front and rear bumpers as well as blacked-out fender badges. Each ROUSH part is built utilizing high-precision injection molding and ROUSH’s industry-leading manufacturing process to deliver OE-level fit, finish, and durability. The ROUSH Super Duty is equipped with 20-inch ROUSH wheels that come with a choice of black or gray trim rings to allow for driver customization. For ultimate all-terrain performance, the wheels are wrapped in highly capable BFGoodrich KO2 All-Terrain LT325/60R20 126 tires. Additionally, each ROUSH Super Duty includes a fully customizable graphics package, embroidered headrests, and serialized ROUSH badging. At ROUSH Performance, it's not enough to deliver thrilling performance and show-stopping style. We take it a step further and back-up the 2019 ROUSH Super Duty with an industry-leading 3-year/36,000-mile limited warranty to show you that we always stand behind our products. Our vehicles are rigorously engineered and tested to prevent issues down the road, but should they occur, you can rest assured in knowing that we're here to help.